Home > Competitive Strategy, Marketing Principles	> Microsoft’s Surface and Disruptive Innovation! There is an old video with Bill Gates talking about Microsoft and Windows version 3, looking at multimedia, pen computing and an early tablet computer. Circa 1991! The technology shown in the video was forward thinking. Today we take it for granted. This was a time pre-web when only businesses had computers. Few people had computers at home and few knew about email or the Internet. The idea of tablet computers is not new. Both Microsoft and Apple had looked at the idea years ago, but at the time the technology was not sufficiently fast, sophisticated or useful enough to grasp the majority of consumers’ interests. Techies loved such devices. (At about this time, ago, I had a boss who had a Psion Organiser. He loved it. Everybody else wondered what he saw in it). That’s the issue with disruptive innovations. It’s not just the disruption that counts. It’s the timing. 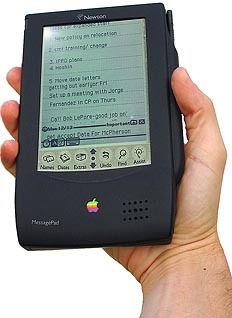 The Microsoft tablet was like the Psion organiser, and even the more tablet like Apple Newton device. The idea was a great idea but the timing was too early, and the product was not able to capture the consumer mind. It’s not the first company that comes out with a disruptive innovation. It’s the first company that captures the consumer’s share of mind – their imagination. As another technological example, the Apple iPod was not the first mp3 player. There were a few before (e.g. the MDiamond Rio and the MPMan player) – but they didn’t have the panache of the iPod – and so were quickly overtaken when the iPod entered the scene. At the same time, entering too late – or basing your product on competitors is also not the way – as Microsoft’s Zune product showed. So who will buy the Surface. Techies – obviously! However businesses that currently equip sales people with netbooks or low-price laptops will also go for it as it is lighter, cheaper and trendier while offering the same or greater utility than the netbooks and laptops they had previously bought. Of course time will tell. That’s what makes something truely disruptive – it’s often only after the new technology has taken over that you can say “but it’s obvious that it would succeed“. If this wasn’t the case – we’d all be flying across the Atlantic on another seemingly disruptive technology that failed to spread even though it provided utility, speed and worked. The supersonic Concorde aircraft never really took off, even though British Airways claimed it was profitable. Only British Airways and Air France flew Concordes. No other airline purchased the aircraft and the Concorde crash in Paris in 2000 effectively sealed its fate. quote: Prime example; The iPad. Do you think Apple came up with it? Not a chance in hell. The creators of Star Trek; The Next Generation did, in 1986 when they created props for the show. Manufacturers came up with similar ideas in the late 90’s, but it wasn’t until 2008 did we have technology of a type that was able to emulate such a grand idea envisioned by Gene Roddenberry and his master SciFi crew. Apple has made a very compelling copy of that idea. But it is only that, A COPY! Android is doing much the same. And each are getting better at it. What I don’t understand is that Tony laughs at the suggestion that a modern interpretation of a tablet can be found in Star Trek, but he doesn’t find it funny that Apple is allowed to patent an idea of a tablet that they wouldn’t manufacture for years to come. What’s the difference? They’re both an idea, an interpretation. Because one is a television series and the other is a consumer electronics company? That doesn’t necessarily mean that Apple’s patent would come to manufacturing fruition, and just because it did, that doesn’t discredit the idea was thought up before Apple.Hell, the scetches in Apple’s tablet patent don’t even look like the iPad, it looks like the Compaq TC1000. Just look at it. It could be anything. It’s 2 rectangles, one within another. It’s that generic, even the iPad doesn’t completely follow it. It has no physical button on the front. The designs don’t show the left and right sides. It shows nothing on the bottom, where the iPad has a speaker and the 30-pin connector. It shows a circle on the top, which could be an on/off button, or it could be an LED. the iPad’s on/off button is not circular. What kind of research and development did Apple have to spend to come up with such a unique design? Who granted this? !Well, who am I kidding, of course Tony laughs at it, because it doesn’t suit his bias. I agree that an iPad type device was seen in Star Trek – and I almost mentioned this. However there is a difference – one is science fiction, the other fact. You cannot (yet and hopefully never) patent fiction. There are LOTS of things that are fictional or described in literature / as a concept, that later became fact. (Jules Verne wrote about a voyage to the moon. Da Vinci described helicopters. Bacon apparently talked about a future with heavier than air flying machines). A patent is different – it gives a physical format to an idea that may have been in the zeitgeist of the time but was never taken seriously as something that would be imminently developed. That’s what Apple did with the iPad and why their patents are justified – even if the final result differs somewhat. I’m reading this in October of 2015. Looks like your article got quite a few things right.